Fabric banners are perfect for applications where you need a lighter weight material, a non-reflective surface, or for higher-end art reproduction work. We can print directly onto a number of different fabrics, including several different types of canvas, no-light banner material (for backdrops), and nylon flag material using either solvent-based inket printers or dye sublimation printers. 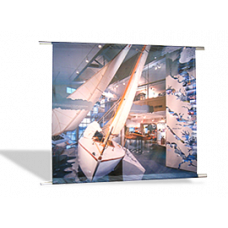 Whether you need a fabric trade show banner, a backdrop for your TV broadcast, or a reproduction of your artwork on canvas, we have a fabric banner option that will work for you. Please browse through the options below to see how we can help you with your fabric banner needs.